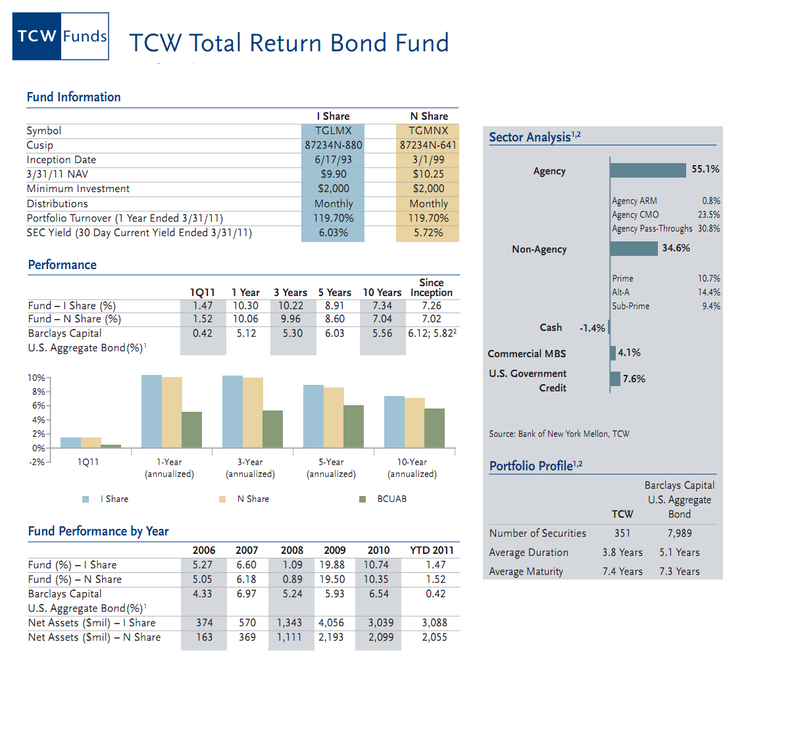 TCW Total Return Bond Fund (TGLMX) is one of the best fixed income mutual funds. This taxable bond fund objective is to provide total return with income. The fund review can be found in this post. 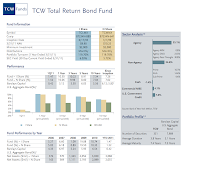 The TCW Total Return Bond fund is seeking to maximize current income and achieve above average total return consistent with prudent investment management over a full market cycle. This TCW fund invests >80% of net assets in debt obligations. It invests mostly in mortgage-backed securities of any maturity or type guaranteed by, or secured by collateral that is guaranteed by, the United States Government, its agencies, sponsored corporations, and in privately issued mortgage-backed securities rated Aa or higher by any nationally recognized statistical organization. This TCW fund has a net asset of $5.33 billion. It has been managed by Tad Rivelle since December 2009. This TCW fund used to be managed by Jeffrrey Gundlach. TCW fired Jeffrrey Gundlach, the firm's chief investment officer and a co-manager of the fund in late 2009. This move was a response to fears that Gundlach would leave TCW soon and take other important fund’s advisors with him. Currently this fund is managed by a team from MetWest Asset Management. This fund currently may invest <50% of asset in junk bonds. This fund also has a high dividend of 7.13%. The minimum balance required to open a brokerage account in this fund is $2,000 and for IRA account is $500. The fund has annual expense ratio of 0.44%. This is a no fee fund. It has neither management fee nor front-end sales load fee. The fund has a five star rating from Morning star. It has recorded 15 years positive performance with the best total return in 2009 with 19.88% and the worst in 1999 with -0.46%. It has returned 9.44% over the past one year and 7.51% over the past decade. The other class of this fund is N Class (Ticker: TGMNX). TGLMX can be purchased from 68 brokerages such as Merrill Lynch, Vanguard, JP Morgan, T Rowe Price, Schwab Retail, TD Ameritrade, Pershing Fund Center, Firstrade, Bear Stearns, etc. As of March 2011, the sector analysis of this fund is 55.1% in agency, 34.6% in non-agency, 7.6% in U.S. Government Credit, 4.1% in Commercial MBS.